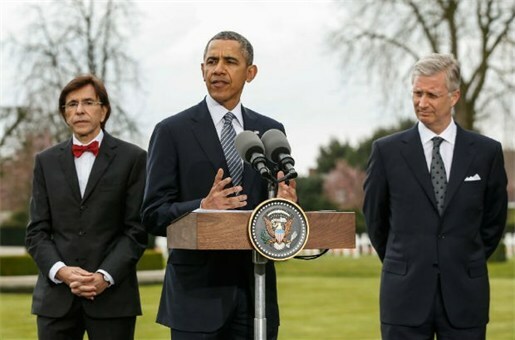 US President Barack Obama has laid a wreath at the Flanders Fields Memorial in Belgium. Di Rupo provided the timely warning that ‘those who ignore the past are taking the risk to relive it’. Chemical weapons were deployed to ‘devastating effect’ in the First World War, said Obama, pointing out they were still being used in Syria and other conflicts. ‘We thought we had banished their use to history, and our efforts send a powerful message that these weapons have no place in a civilised world. This is one of the ways that we can honour those who fell here. This visit, this hallowed ground, reminds us that we must never, ever take our progress for granted,’ the President added. The US President and European leaders are to discuss Russia’s armed seizure of the Crimean Peninsula and the West’s possible responses this week. This entry was posted in News and tagged Barack Obama, Belgium, First World War Centenary, In Flanders Fields, news, UK News. Bookmark the permalink.